For National Disability Employment Awareness Month, check out the many resources available in the National Clearinghouse of Rehabilitation Training Materials (NCRTM), funded by the Rehabilitation Services Administration (RSA). We offer pointers for finding up-to-date resources in the NCRTM library and showcase a few products from the RSA-funded technical assistance (TA) centers. The Workforce Innovation and Opportunity Act (WIOA) supports a vision that people with disabilities, including those with the most significant disabilities, can work in competitive and integrated employment. The NCRTM is one of the first places you should go to find promising and effective practices that have been shared by RSA-funded projects and TA centers so that vocational rehabilitation (VR) personnel, employers, families and individuals with disabilities can improve employment outcomes for people with disabilities. We constantly add new resources to the NCRTM library, which you can search for by keyword or topic. 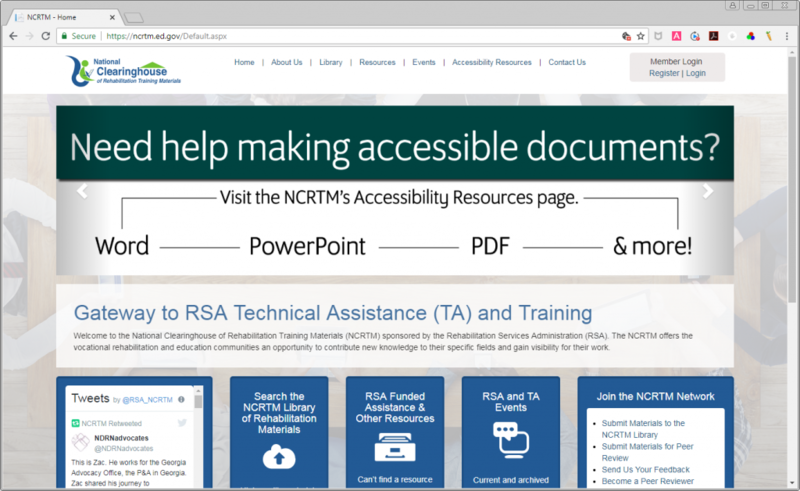 You can also quickly search the library by clicking on icons that link to RSA information and guidance, products developed with RSA funding, RSA-funded TA centers, peer reviewed products and sign language interpreter resources. Whether you are a person with a disability, a VR professional or service provider, an educator, interpreter, or in business, the NCRTM contains useful, interesting and accessible resources to learn more about a topic or share ideas and resources with others. The following resources from three RSA-funded TA centers demonstrate the type of information you can check out as you explore ways to celebrate National Disability Employment Awareness Month. Contains the Paid Work Experiences Toolkit that explains internships, pre-apprenticeships and apprenticeships and includes case studies and highlights models across the U.S. Though funding for this JDVRTAC ended September 2018, the Workforce Innovation Technical Assistance Center (WINTAC), in partnership with the Institute for Community Inclusion and the University of Washington, will continue to provide technical assistance to VR agencies in the topic areas covered by the JDVRTAC through September 2020. Project E3TC provides technical assistance so state VR agencies and their community-based partners can address barriers to VR participation and competitive integrated employment of historically underrepresented and economically-disadvantaged groups of individuals with disabilities. Highlights poverty research and resources that are updated regularly. PEQATAC helps state VR agencies improve performance management by building their capacity to carry out high-quality program evaluations and quality assurance practices that promote continuous program improvement. VR professionals from 50 states attended September 2018 summit in Oklahoma City, Oklahoma. Attendees collaborated and shared resources for quality employment outcomes from state-federal vocational rehabilitation services to people with disabilities. Attendees learned evaluation results and research outcomes from practitioners and researchers and gained insight on VR agencies’ strategies for internal controls, program evaluation, skills gains, and other workplace integration processes. The first PEQA graduate, Margaret Alewine from South Carolina VR, presented her Capstone project, which designed to enhance the Comprehensive Statewide Needs Assessment (CSNA) related to services for youth and students, at the Summit Conference. She received her certificate at the completion of the conference.